Tags: all in for cp, Ballys Casino, charity, Jacob Zalewski, One Step Closer Foundation. It's that final month again before the year ends, and this December is another great opportunity for the poker world to be charitable. 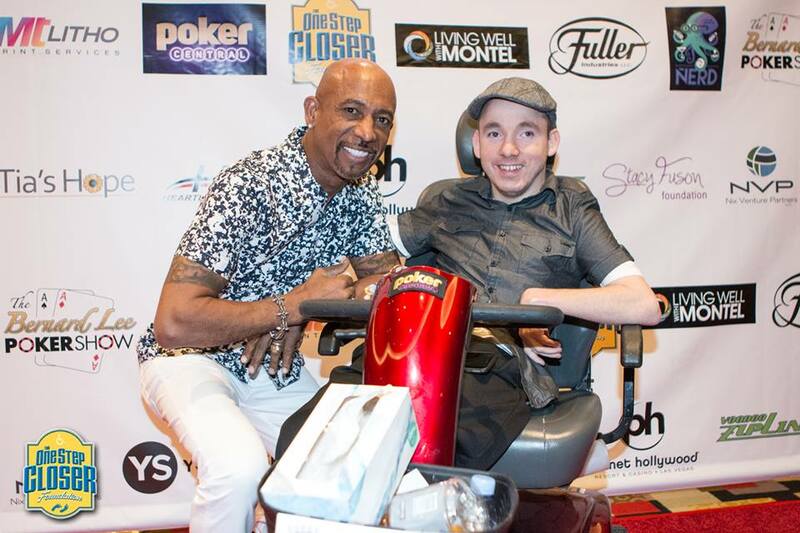 This poker charity event will benefit the One Step Closer Foundation (OSCF), an organization that aims to help people thrive and be happy despite the hardships they experience brought about by cerebral palsy. The event, named "All in for CP" shall be held at Bally's Casino, Las Vegas on December 9. The event is open to the public, which means poker fans who join can get to play for a cause as well as meet famous poker players and celebrities! This event is one of the two yearly charity poker tournaments that the OSCF hosts in Las Vegas (the other one is during summer at the WSOP). The poker tournament has a total buy-in of $350 with $100 re-buys and $100 add-ons. A total of $25,000 in cash and prizes await the top 15 players, with the 1st placer getting a sweet $10,000 cash prize guaranteed! Other cool prizes that await the lucky winners include: hotel weekend packages at the Bellagio, Planet Hollywood and Aria (hotel stay, dinner and show tickets), a buy-in for Friday Night Poker by PokerGO and Stadium, and buy-ins to the Raising the Stakes charity tournament in 2019. There's even a silent auction on the schedule, where attendees can have the chance to bid on an assortment of sports memorabilia. VP of Marketing and Operation for The One Step Closer Foundation Bernard Lee said, "Honestly, I believe that we have some of the best prizes around for a charity poker tournament. However, I don't think that is the main reason why players come back year after year. The real reasons are that everyone comes to support such a good cause especially Jacob and everyone truly has an incredibly fun time. 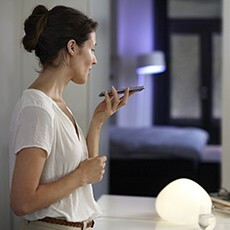 It is always such a party atmosphere." 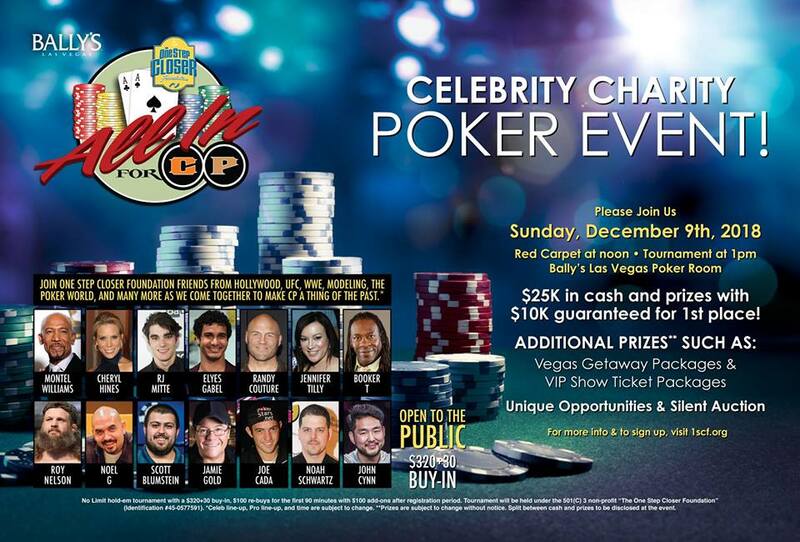 Some of the celebrities and poker personalities attending the charity poker event include: Cheryl Hines, Elyes Gabel, Montel Williams, Randy Couture, RJ Mitte, Booker T, Roy Nelson, Noel G, Joe Cada, Noah Schwartz, Jennifer Tilly, and the two most recent WSOP Main Event champs Scott Blumstein and John Cynn. According to their website, The One Step Closer Foundation is a non-profit, charitable organization whose main goal is to ease, as much as possible, the lives of those who suffer from Cerebral Palsy. Founded in 2007 by Jacob Zalewski, The One Step Closer Foundation (OSCF) is a non-profit, charitable organization whose main goal is to impact the lives of those who suffer from cerebral palsy. The OSCF will, through various fundraising efforts, support existing groups, individuals, and research. For those already coping with cerebral palsy (CP), the OSCF strives to promote awareness and understanding of the disease through education programs, support groups and access to previously unknown research. The OSCF will also direct funds to researchers seeking for medical advancements in treating and diagnosing CP. Jacob Zalewski himself is a cerebral palsy individual, born 3 months premature in 1983 (pictured center), and he was only given a 3% chance of survival at birth. Even though he exists with this condition, Zalewski considered it as a blessing, using himself as an example to positively inspire others. With the help of the creator of the Simpsons, the late Sam Simon, Zalewski put up the One Step Closer Foundation in 2007. Zalewski said, "I never imagined that we would raise over $1 million and be having regular tournaments for the past 12 years. Every year, I'm truly humbled to see the support that the foundation receives. I want to thank everyone who has ever come out to play in one of our events." Flopped Royal Flush At Charity Event - Won $100,000! 6 comments for "All In for CP Celebrity Charity Poker Event at Bally''s Casino to Benefit those with Cerebral Palsy"